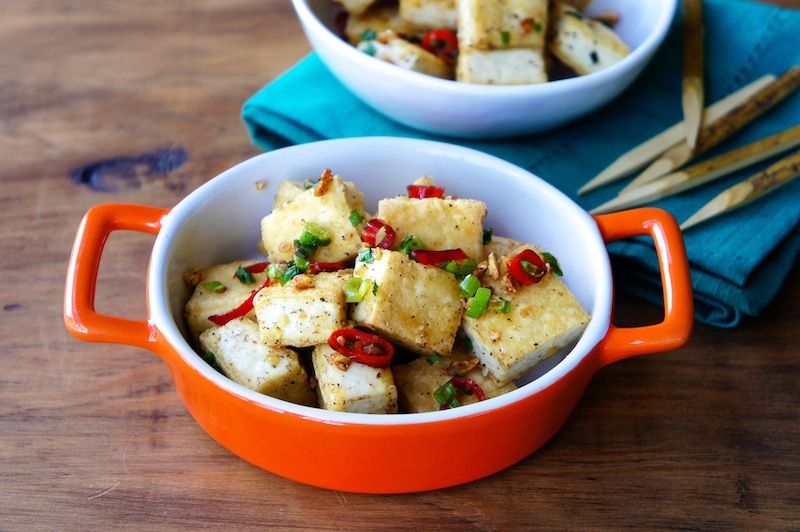 Make sure to try this yummy Pan-Fried Black Pepper Tofu recipe. It's a great appetizer made with firm tofu cubes, garlic, black pepper, red chilies, and scallions. Rub tofu with, salt, pepper and toss with rice flour. Heat a large skillet or pan over medium-high heat. Add 1 ½ Tbsp of oil and pan-fry the tofu until golden in color. Toss in the garlic, stir, and mix in the chili, black pepper, Sichuan pepper, sea salt. Continue to stir and fry until all the ingredients are well coated. Top with some scallions before serving. Yum. My mouth is watering just thinking about this dish. A classic and a great way to eat Tofu. Yep, I'm on board with this. Love how it's pan-fried and not deep-fried tofu cubes! These tofu cubes look absolutely delicious Angie! Can't believe I hadn't found your blog before. I am half Chinese but I struggle to make any type of Asian food as I was raised in Australia and my mum never cooked anything traditional. I'm going to give your recipes a go and hopefully discover my roots in the process, thanks!